History isn't any one thing. It's alive. It is still being uncovered. It tells stories, celebrates people, and places and connects us to the larger world. 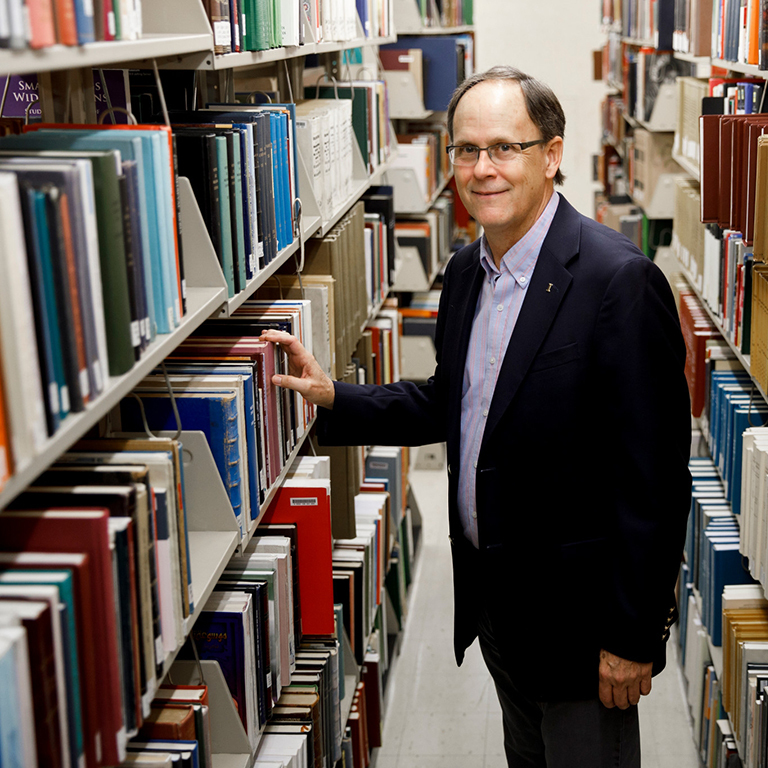 History is all this and more for James Capshew, university historian for Indiana University. Capshew explores and shares IU's history through research and public outreach. He also works with units across all campuses to share resources and educate students and the community about IU's rich past. "IU has a huge historical footprint that needs to be managed, interpreted and protected," Capshew said. Capshew doesn't do the important work of recording IU's history alone. He works with a Council of University Historians along with Kelly Kish, director of the Office of the Bicentennial, and her staff. Together they are delving into IU's history, finding new ways to make it accessible and adding to it before the IU Bicentennial in 2020. "The university is a human institution, a collective that relies on individuals but for a bigger, greater cause," Capshew said. Capshew and the Office of the Bicentennial work closely with the IU Archives, IU Alumni Association, IU Foundation, and faculty and staff on IU's campuses around the state. Together, they are hard at work on several initiatives that will involve the IU community in a celebration of the bicentennial. Among their 25 signature projects is an oral history program to record interviews with IU alumni, faculty and staff; a historical marker program to identify and mark people, places and events of historical significance to IU; and a traveling exhibit of art, design and museum-type installations and music. In addition, grants have been made available to faculty and university departments statewide to develop courses and research projects that explore IU's history. A bicentennial time capsule will also be created to leave a footprint for future generations. The university's history will also be accessible via online databases that will offer timelines about IU's faculty members, international programs, philanthropic gifts, significant moments in the construction of IU's buildings and changes in its landscape, and notable achievements in scientific research and the arts and humanities. The university is a human institution, a collective that relies on individuals but for a bigger, greater cause. While many of these initiatives will culminate during IU's bicentennial year in 2019-20, Capshew is certain the work will continue to not only serve as a record of IU's past but also to shed light on the trajectory of IU's contributions to the state, nation and world as it enters its third century. "The university brings together many people, generation after generation, to share ideas, techniques and emotions toward the goal of education and learning," he said. "It's a monument to human curiosity." Capshew is IU's first official university historian, but he's not the first faculty member to write about IU history. While IU has taken an innovative step to designate a historian for the university, a few faculty members took it upon themselves to record IU's past. David Banta, the first dean of IU's School of Law, took the first historical look at the university in the 1880s. Faculty members Theophilus Adam Wylie, Ivy Chamness, James Woodburn, Burton Myers and Thomas Clark also wrote or edited volumes on IU's history. Their books line Capshew's shelves, and their pages are labeled with colored paper so he can return to those moments in time and study them further. One historical incident Capshew intends to dig into deeper is the so-called "Faculty War of 1832" that Banta reconstructed. It involves a mysterious note written on then-President Andrew Wylie's stationery and left in Baynard Rush Hall's office. Wylie, Hall and John Hopkins Harney were the only IU faculty members at the time. The unsigned letter claimed the students felt Hall was a terrible teacher and should either be fired or resign. A battle erupted between the three faculty members over questions about the letter and who wrote it. Within a year, Hall resigned and Harney was fired. The letter writer's identity wasn't known by anyone until 50 years later, when Banta received a letter from the perpetrator in 1882. Banta kept the letter writer's identity confidential when he wrote about the incident. The letter eventually found its way into the IU archives, where it was rediscovered nearly 120 years after it was written. The author of the mysterious 1831 note was none other than the president's 16-year-old son, student Andrew Wylie Jr. Questions remain about Andrew Wylie Jr.'s reasons for writing the letter and Banta's motives for not revealing the name of the writer. It's such questions that Capshew is eager to explore. "It's a wonderful puzzle," Capshew said. "A very interesting and complex story." The "Faculty War of 1832" is only one episode of an infinite variety that make up IU's history, and those stories are what Capshew hopes to share in efforts to connect people to IU. "It's about stories," he said. "That's what people will remember and react to and why people feel connected to the university. They take you beyond your individual experience, and you become part of something bigger than yourself."